The Pentagon announced earlier this month that it had issued a diplomatic demarche in response to multiple incidents in which Chinese personnel had directed high-power “military grade” lasers at U.S. aircraft operating around Camp Lemonnier in Djibouti, which is located less than a mile away from a new Chinese base. One of the attacks had caused “minor eye injuries’ to two C-130 Hercules transport pilots, who experienced dizziness and continued to see ‘rings’ well after they had landed. A new policy requires pilots wear protective eyewear while approaching the base. Flashing lasers at an aircraft is a common and dangerous form of harassment—even in the civilian world—because illuminating an aircraft cockpit with a laser can disorient and temporarily blind flight crew, and it can also possibly inflict longer-lasting ocular injuries. Lasers are also effective at destroying sensitive electro-optical sensors. The South China Morning Post quoted a Chinese military analysts speculating the lasers may have been attempting to disable “spy drones” overflying the Chinese base, which have elicited complaints from the garrison. (Official Chinese press organs, on the other hand, deny the allegations.) It is also possible laser harassment may have been unauthorized mischief undertaken by local personnel. In any case, laser weaponry is rapidly becoming a reality of the twenty-first century. During the second half of the twentieth century, the Soviet Union tested laser-armed tanks, satellites and anti-aircraft dazzler systems. More recently, the United States has ramped up programs to make laser anti-drone and anti-missile systems for ships, armored vehicles and even aircraft—many of which may become operational by the early 2020s. China, however, has a history as an early leader in creating man-portable laser dazzlers, used to blind personnel and knockout sensitive electrooptical sensors. In 1995, the Norinco firm unveiled the ZM-87 Portable Laser Disturber at arms expos in the Phillipinnes and the United Arab Emirates. The fifteen-milliwatt neodymium laser, capable of discharging five pulses a second, was explicitly designed to inflict permanent eye damage on enemy personnel with ranges of two to three miles, or temporary blindness as far as six. Weighing seventy-seven pounds on its tripod-mount and connected by a thick cable to a power unit, the ZM-87 resembled the crew-served blasters used by stormtroopers in the film The Empire Strikes Back. The entry of the ZM-87 on the international arms market prompted concern however, and the same year an amendment to the 1980 Geneva Convention on Certain Conventional Weapons was made that effectively outlawed it. The Protocol on Blinding Laser Weapons, to which China and the United States are signatories, explicitly forbids the use of laser weapons designed to permanently blind a human being. The Protocol did not come into effect until 1998, however. Norinco produced twenty-two ZM-87s, several of which were apparently sold abroad. On April 4, 1997, a Canadian military CH-124 helicopter began photographing the Russian merchant ship Kapitan Man, which was believed to be a spy ship due to abnormal antennas and a prior record of espionage activities. While hovering just six miles off Port Angeles, Washington both the Canadian pilot and a U.S. Navy intelligence officer onboard experienced temporary blindness and severe eye pain believed to have resulted from a ZM-87 laser. Though both crewmen apparently suffered lasting impairments from the episode, the presence of a laser onboard the Kapitan was never positively confirmed. Later in 2003, two Apache helicopters training near the demilitarized zone separating North and South Korea were illuminated by a laser thought by intelligence officials to be a ZM-87 purchased by North Korea. The Protocol does not cover inadvertent human blindness caused by systems designed to disable sensors. For example, China’s advanced Type 99 main battle tank is equipped with a powerful laser dazzler intended to disable laser range finders and target designators of battlefield opponents—which could cause blindness to, say, the gunner of an opposing tank. The Chinese and U.S. military also does not interpret the protocol as banning dazzler laser weapons that cause temporary blindness. For this reason, the U.S. and England have used lower-power dazzlers such as GLARE MOUT and GLOW systems in Iraq and Afghanistan as a non-lethal means to compel drivers of civilian vehicles approaching checkpoints to halt. China, meanwhile has continued to develop an array of laser ‘small arms’ the size of an assault rifle or a rocket launcher, typically exhibited at police equipment expos and carefully described as inflicting temporary blindness. As these are intended for domestic sales, open source English-language on these systems is limited. However, Chinese-language media does offer additional details, though far from a complete picture. The older WJG-2002 Laser Dazzler is clearly intended to resemble the standard bullpup Type 95 assault rifle used by the Chinese military, as you can see in this photo, though it is heavier at eleven pounds. This attempt to ‘blend in’ with standard infantry weapons recalls the Soviet ROKS flamethrowers, designed to resemble a bolt-action rifle so as not to draw attention, down to having a wooden exterior. The WJG-2002 pulses a green laser three times per second (green lasers are more damaging to eyesight than red lasers) which reportedly can ‘dazzle’, cause dizziness, and blindness. Made using nylon-injection molding, the WJG-2002 is supposedly waterproof, can operate in temperatures ranging from -50 to 20 degrees Celsius, and has good ergonomics. It has a range of only fifty meters, though an antenna attachment can extend this to one hundred meters (roughly the length of a football field) and another datasheet lists a maximum range of two hundred meters. Its integrated rechargeable battery can sustain twenty minutes of continuous fire. The short effective range does support the official line that it is intended as an ‘anti-terror, anti-riot’ weapon, though it would also have applications for special forces. Another beefy assault-rifle lookalike is the BBQ-905 Laser Dazzler (photo here). Also weighing eleven pounds, it can discharge three pulses a second, each with a maximum strength of two hundred millijoules, for a three second burst. Its integrated battery can discharge three thousand pulses. Notably it is described as having a range of 1,000 meters, which would considerably increase its military applications compared to the WJG-2002. Indeed the BBQ-905 appears to be more oriented for disabling electro-optical sensors first and personnel second. Even more intimidating in appearance are newer, bazooka-like PY131A and PY132A laser dazzling systems. The older PTY131A has a boxier appearance and weighs 14 pounds; you can see a technical data sheet here and a photo here. The smaller, newer 132A is more sleekly cylindrical, resembling a sci-fi plasma rifle, and weighs only 9 pounds (photo here, datasheet here). Both have maximum range of four hundred meters and benefit from a telescopic sight with 3x magnification. The PY lasers have a wavelength of 532 nm and an automated system apparently regulates the beams scatter “on hitting a face” to twenty to thirty centimeters in diameter, causing temporary blindness for ten to sixty seconds. 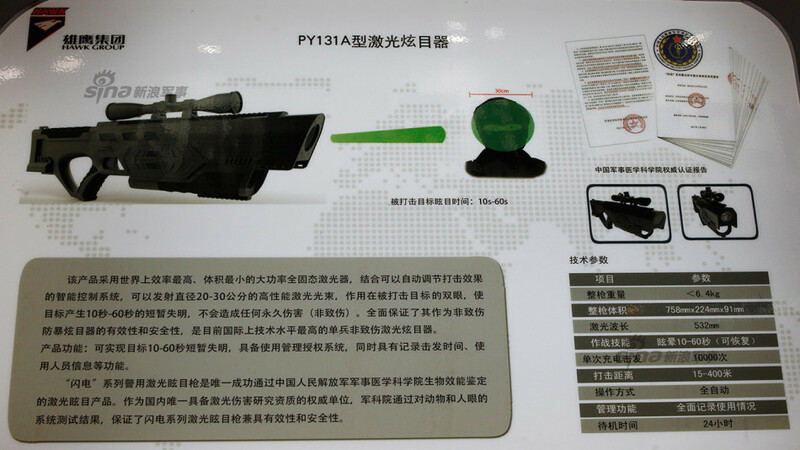 Supposedly one charge is sufficient for ten thousand shots, and the PY132A is the “only laser to have passed certification with the Chinese Academy of Military Medical Sciences.” The manufacturer also boasts the PY132A’s smart gun technology restricts use only to authorized personnel, and also records each firing incidents for later analysis. Some Chinese sources appear to conflate the PY131A with the trailer-mounted Low Altitude Guardian anti-drone laser cannon, a ten-kilowatt laser with an effective range of one to two miles. Chinese publications depict additional laser-small arms for which less information is publicly available, such as the submachine-gun sized A1201, for which only a picture is available. Another article describes a vaguely named “New Non-Lethal Laser” which uses an eight-kilowatt short-pulse beam to incapacitate targeted individuals by briefly heating surface of their skin to 500 degrees Celsius, causing intense, paralyzing pain. If real, the new Chinese laser calls to mind the U.S. Army’s trailer-mounted Active Denial System which uses a heat ray to inflict pain on people in a broad area, inducing exposed persons to flee without causing permanent damage. Intended as non-lethal crowd control system, the ADS was deployed to Afghanistan but never used operationally.